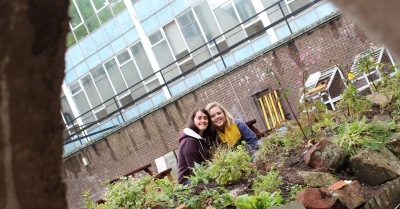 A bee-friendly garden is being created on campus at Robert Gordon University (RGU) after two students was inspired by the plight of the insects. Final year Communication Design student Xanthe Bodington (23) took a beekeeping course run by the Aberdeen Beekeepers and District Association last year and said the experience sparked her interest in the subject. 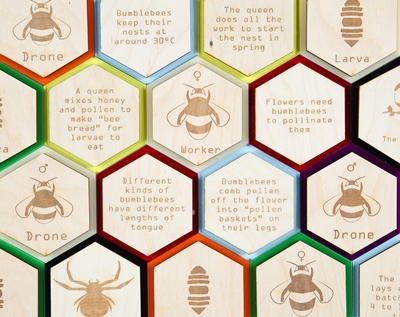 She has made bees and pollinators the focus on her honours project, which will go on show at the Gray’s School of Art Degree Show on June 18, but alongside classmate Alice Brown, wanted to do something else to help raise the profile of the threats facing the insects. Xanthe said: “Through my project I have researched the threats that pollinators face and how it is already affecting us in certain places in the world. Without bees and pollinators we would have to say goodbye to a third of the food we eat. She explained: “One of many ways to help is by simply planting bee-friendly flowers and plants. This will provide vital food sources for native pollinators and help replace wildflowers and other plants which bees and pollinators need that have been disappearing due to monoculture and urbanisation. “So far it has been very successful and we have been helped along by the university, the general public, Aberdeen City Council and in particular the council’s Countryside Ranger Service which has given us expert advice, volunteers and donations of native flowers and plants to our cause. Xanthe said that she hopes her efforts help demonstrate that anyone can do their part to help pollinators by planting bee-friendly flowers, whether in flowerboxes if you live in a flat, putting pots of plants on your doorstep or helping out with similar projects. Xanthe’s final year communication design work will go on display at Gray’s School of Art as part of the Degree Show, sponsored by BP for the thirteenth year, from June 18 to 25.